Teenagers' Latest Bad Idea: Drinking Hand Sanitizer : Shots - Health News Teenagers are turning to hand sanitizer in search of a cheap legal buzz, poison control centers report. Doctors say it's dumb, and dangerous. Keep the sanitizer on your hands and out of your mouth. Teenagers can be pretty creative in their pursuit of a cheap buzz. Last month we reported on the "cinnamon challenge," which involves snarfing down a spoonful of the powdered spice. Now we've got teens quaffing hand sanitizer, and ending up sick in the ER. A spike in the number of teenagers who became ill after drinking hand sanitizer in Los Angeles County — 16 cases in March and April, according to the California Poison Control System. Now there's a flurry of reports from other parts of the country, too. 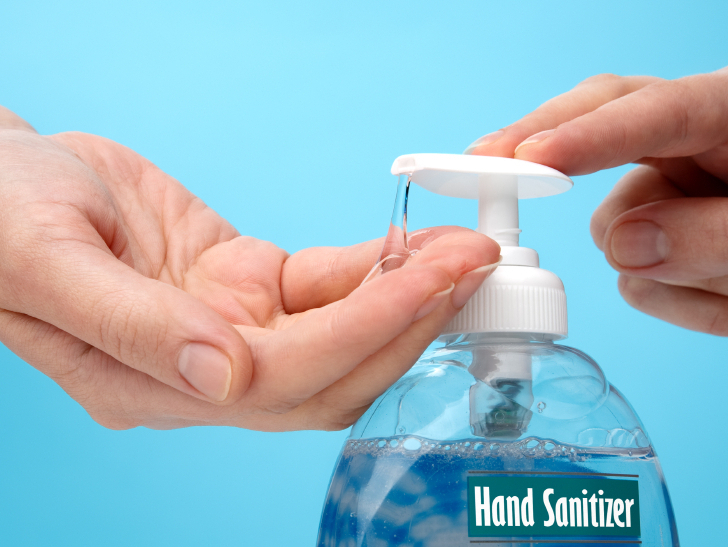 Hand sanitizer kills germs because it's made with ethyl alcohol. That's the same stuff that gives a glass of wine its pleasant buzz. I've never imbibed hand sanitizer, but my guess is that it lacks the complex bouquet of a good cabernet. Indeed, I'd guess that it tastes nasty. But don't take my word for it. Check out the reaction of comedian Jimmy Kimmel, who did hand sanitizer shots with actor John Cusack on Kimmel's show last night. "I feel cleaner inside," Kimmel said in the video (below). "And I also feel like I'm going to die." Teenagers apparently agree, and some have been using salt in an attempt to separate the gel from the alcohol. Hand sanitizers are typically about 60 percent alcohol, according to Cyrus Rangan, an assistant medical director for California Poison Control. That's 120 proof, on a par with some really strong vodkas. His organization has tracked about 2,600 cases of hand sanitizer ingestion since 2010, most of them in small children who ate it by mistake. The spike in hand sanitizer poisonings among teenagers is "unusual," Rangan says, which led him to turn to Children's Hospital of Los Angeles to help publicize the issue. No one has died from ingesting hand sanitizer, he says, but ethyl alcohol is toxic. "Parents should regard hand sanitizer as you would a medication," Rangan says, and keep it tucked away. Inconvenient, to be sure, but "it does give you some measure of control." The other option, he told Shots, is to go for less appealing foam hand sanitizers. Those of us who weren't born yesterday may recall teenagers' attempts to get a buzz by drinking mouthwash, or Robitussin cough syrup, or even vanilla extract. Mouthwash now has much less alcohol in it as a result, Rangan says. And many retailers have moved cough syrups with dextromethorphan, the ingredient that provides a bit of a buzz, behind the counter. Will Purell be the next victim of teenagers' pursuit of mind-altering chemicals, no matter how dopey the form?